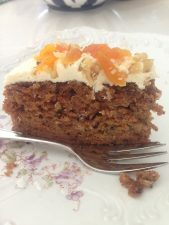 If you have a special occasion and want to celebrate with some baking then this carrot cake is so easy to make. As the toppings on baking can greatly increase the overall energy consumed I have included nutritional information for you to consider. Place the sugar, eggs and oil into a bowl and using a food processor, beat well to combine. Add the flour, soda and cinnamon and process until well mixed. Lastly stir in the carrot and walnuts. Pour this mixture into a well-greased or lined 18 cm square cake tin. Bake in a moderate oven 180-190 °C for 45 minutes or until cooked when tested with a cake skewer. Each serving (70g) contains: Energy 1132kJ/270kcals; Protein 4g; Fat 18.8g; Saturated fat 1.62g; Carbohydrate 20.8g; Sugars 11.7g; Dietary fibre 1.37g; Sodium 129mgs. Replacing the walnuts with sultanas or other dried fruit offers less fat, and more dietary fibre but also increases the energy, carbohydrate/ sugar load. – Chopped nuts: 2Tbsp walnuts,1 Tbsp pumpkin seeds and 8 thinly sliced apricot halves.